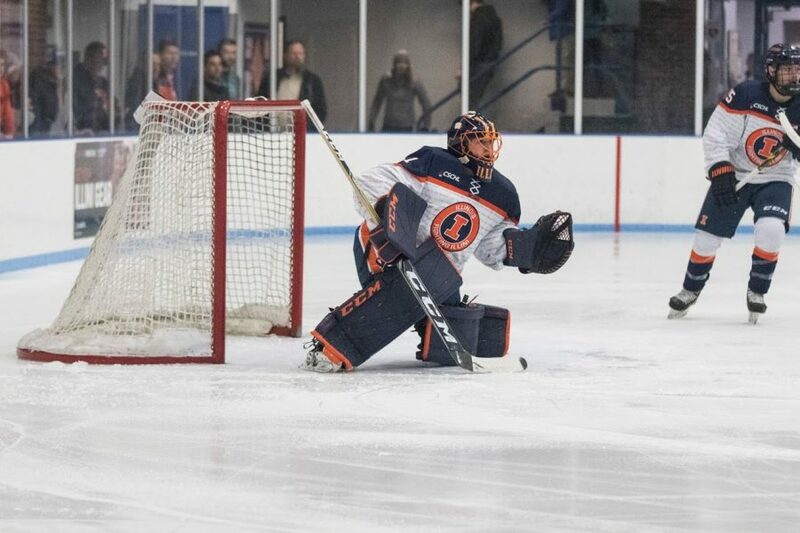 Jake Barnhart protects the goal to prevent Robert Morris from scoring at the University of Illinois Ice Arena on Nov. 2. 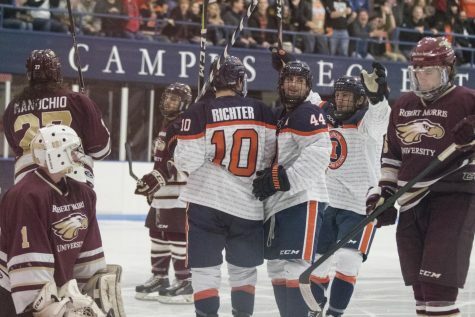 Illini shut out Robert Morris 6-0. Friday’s first period set the tone for what became a tight defensive contest between Illinois and Ohio. After a scoreless first 10 minutes, the Bobcats got on the board with a shot into the Illini net at the 9:19 mark. Ohio freshman Ryan Higgins and Illinois sophomore Jack Healy were both sent to the penalty box for 2:00 with just under four minutes to go in the first, but neither team scored for the rest of the period. The Illini drew a power play opportunity nearly halfway through the second period. However, the y couldn’t score after holding the temporary advantage. Both teams retained their defensive intensity in the second, with no goals being scored either way. The Illinois scoring drought continued in the third, and Healy was sent to the penalty box for the second time of the evening for charging. 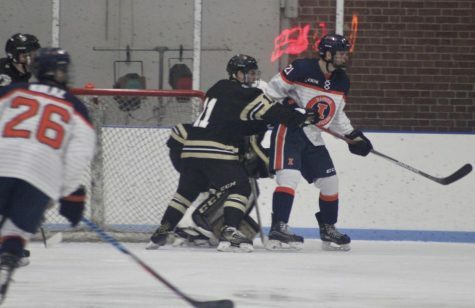 But the Illini gained the power play back around the halfway mark when senior defender Grant Hazel of the Bobcats was sent to the penalty box for two minutes. Despite the opportunity, Illinois still failed to convert an open look. Penalties were exchanged down the stretch, with one on junior Chance Homerin at the 3:27 mark and another on Nick Grose of the Bobcats at the 46.5-second mark, but no scoring came and Ohio walked away with a 1-0 victory. The first period on Saturday would play out in similar fashion, with the Bobcats finishing the period up 1-0. But for the entire second period, momentum wildly swung in favor of the Illini. Capitalizing off of a slew of Bobcat mistakes, the Illini got their first goal of the evening off of a shot from Opalka on a power play with 14:04 remaining. The goal ended an eight-period streak of shutting opponents out by Ohio goalie James Thomas. 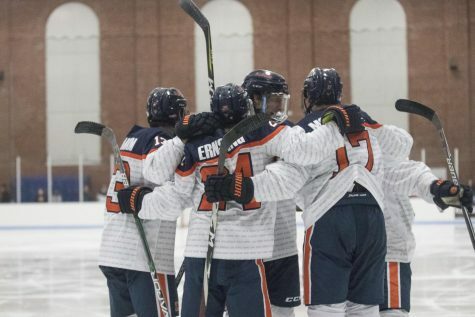 Later, around the 11:00 mark, the Illini gained another one-man advantage on a power play, resulting in a goal by sophomore Thomas Kolaz to put the Illini up 2-1 halfway through the second. Kolaz has scored three goals in his last four games. 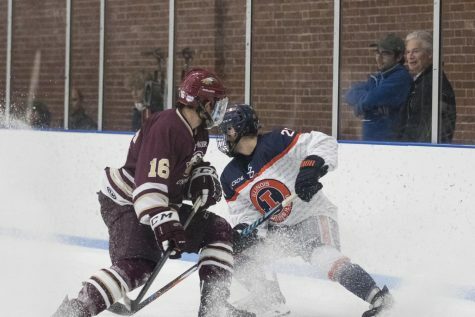 The Illini held their ground against an increasingly frustrated Bobcats squad and finished the period up 2-1. The third period remained devoid of penalties in its first 14 minutes. Ohio began to channel its aggression offensively, keeping the puck on the Illinois side of the rink and limiting several Illini possessions. However, the Illini continued to hold steady and kept the score at 2-1 with 4:13 remaining. Ohio’s offensive pressure would eventually pay off, and in a scramble off of a defensive save, they were able to score again to tie it back at 2-2 with 2:58 remaining. Neither team was able to convert in the next three minutes, resulting in a five-minute overtime period. The overtime period would open up with a fast-paced exchange in the three on three matchup. 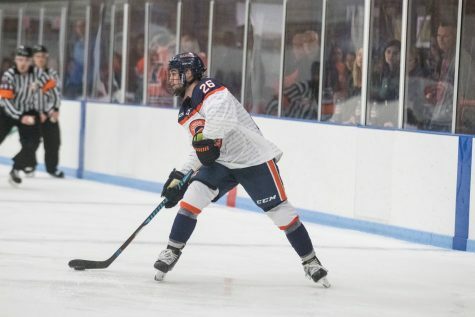 With 2:33 left, Illini senior Stephen Quinn was sent to the penalty box, allowing the Bobcats to add a player on the floor, giving them a four-on-three advantage offensively, but they were unable to capitalize before the Illini could put their own fourth man on the ice. 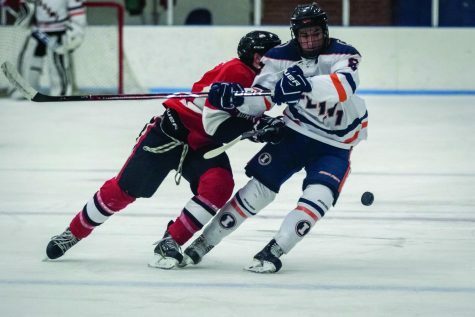 In the final seconds of the game, Homerin missed what would have been the game-winning goal, but after a collision with Thomas, an ensuing scuffle resulted in Homerin being knocked to the floor with 2.2 seconds left in the period. The tension continued before play resumed and resulted in Grose and junior defender Mark Condotti both being sent to the penalty box. However, the Illini weren’t able to score off their next chance, resulting in a shoot out. After Ohio failed to score on their opportunity, freshman Kacper Ryba scored to give Illinois the advantage. The Bobcats responded to even the score back up with a goal from Houston, while Bobby Ernsting would miss the second shot for the Illini. A key save from Jake Barnhart stopped freshman Drew Magyar’s shot, and a goal from Kolaz gave Illinois the victory. After splitting the weekend, the Illini’s record moved to 15-18 on the season, while the Bobcats left Champaign 16-8. Walking away with the shootout victory, Saturday’s match at the Big Pond was one of the Illini’s most emotionally intense wins of the season.